shopspaViolet is Serious Skin Care, Serious Fun: How does Niacinamide work on acne ? EltaMD Acne Regime Knocks Out the Pimples! The anti-inflammatory provisions of Niacinamide ( vitamin B3 ) reduces dryness, irritation and redness caused by bacteria in clogged pores or simply the dreaded pimple. Studies have shown that Niacinamide diminishes the sebum excretion rate or ( SER ). SER is the amount of oil sebaceous glands produce. The result is a reduction in clogged pores, therefore a reduction in whiteheads and blackheads. Niacinamide is also a temperate keratolytic that promotes mild exfoliation which prevents pore blockage. A protocol chock full of Niacinamide is EltaMD AM, EltaMD UV Clear and EltaMD PM. EltaMD AM Therapy , the morning moisturizer contains willow bark that stimulates cell turnover and of course Niacinamide that we know combats acne. EltaMD PM Therapy moisturizes, repairs and restores skin while sleeping. Ceramides , Niacinamide and antioxidants improve skin tone, elasticity, color and speed the nightly skin repair process. 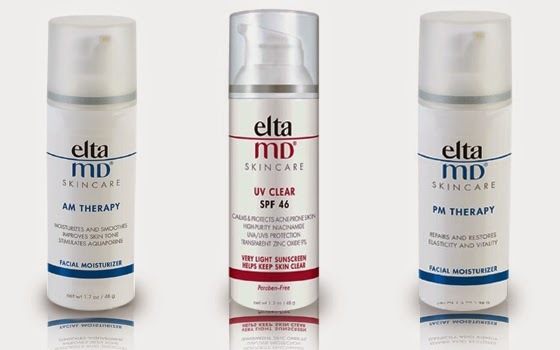 EltaMD UV Clear helps soothe sensitive skin types susceptible to breakouts, rosacea and hyperpigmentation. UV Clear contains hyaluronic acid, lactic acid and of course Niacinamide . In one clinical study 82% of people with inflammatory acne showed a marked improvement using Niacinamide topically for eight weeks. In addition 60% had a reduction in papules and pustules and 52% in mild acne. An added bonus is the 9% transparent micronized zinc oxide which protects skin against UVA ( aging ) and UVB ( burning ) rays. This sunscreen is ideal for outdoor activities. I use it poolside , that and a stiff martini.....remember to re-apply. The daily use of these three products along with an efficient cleanser is a superb acne regime.